Basilan is the largest and northernmost of the major islands of the Sulu Archipelago and is located just off the southern coast of Zamboanga Peninsula. Basilan is located between latitudes 6°15' and 7°00', and longitudes 121°15' and 122°30'. The island is bordered by the Basilan Strait to the north, the Sulu Sea to the northwest and west, the Moro Gulf to the northeast, and the Celebes Sea to the south, southeast and east. It is one of the 7,107 islands that make up the Philippine archipelago. Basilan first came to European attention when it was documented by the remnants of the Ferdinand Magellan expedition in 1521. It was eventually colonized by the Spanish as early as 1636 and was formally ceded by the Sulu Sultanate to Spain in 1726. Then President Marcos made Basilan a province in 1973. It joined the Autonomous Region in Muslim Mindanao in 2001, the last province to do so. Its former capital, Isabela City, however, opted out and remains a part of the Zamboanga Peninsula Region (formerly Western Mindanao, Region 9). The ancient name of Basilan Island was Tagime, named after a Datu ruler who once ruled a big part of the island before the Spaniards came to Basilan. In the long past, Basilan had other names. It used to be named ULEYAN, derived from a mountain located at the heart of the island. Later, it was changed to MATANGAL, also named after Mt. Matangal in Tuburan. Other names given were Puh Gulangan (island of forest); Umus Tambun (fertile land); Kumalarang, named after a river; Bennuh Peggesan; and later it was changed to Basih Balan which was derived after a heavy fight between the natives led by Sultan Kudarat, a great Muslim leader and his brave Muslim warriors, Apuh Menggah, Apuh Dagang, and Apuh Batalan against the Spanish invaders from nearby Zamboanga. After a fierce resistance, the natives successfully repulsed the invaders. The victory played a major role in changing the name of the island into "Basih Balan", derived from their legendary weapon called "Pira" which was made of basih, meaning iron and balan, meaning magnetic. By combining the two words, it became Basih Balan. 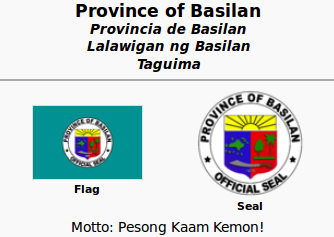 But when the early historians wrote the name of the province, it was shortened to Basilan. The name Basilan remained unchanged up to the present. Basilan is subdivided into eleven municipalities and one city as administratively part of the Autonomous Region in Muslim Mindanao (ARMM) while the capital city, Isabela City, is administered as part of the Zamboanga Peninsula Region. The Yakans are the traditional settlers of Basilan Island in the Southern Philippines, situated to the west of Zamboanga in Mindanao. Approximately 55% of the people speak Chavacano; 20% Samal; Joloano, Yakan, and Maranao; 10% Visayan; 10% Tagalog, 5% llocano and other dialects. The province of Basilan has an aggregate historical jurisdiction of 135,892 hectares (335,800 acres), with mainland Basilan encompassing an area of 124,892 hectares (308,610 acres). Currently, there are two hundred sixty five (265) Primary/Elementary schools, twenty one (21) Secondary composed of private/ public schools, and seven (7) Tertiary School/Colleges, shown in Table 6.2.1 – Existing Schools, by Level. 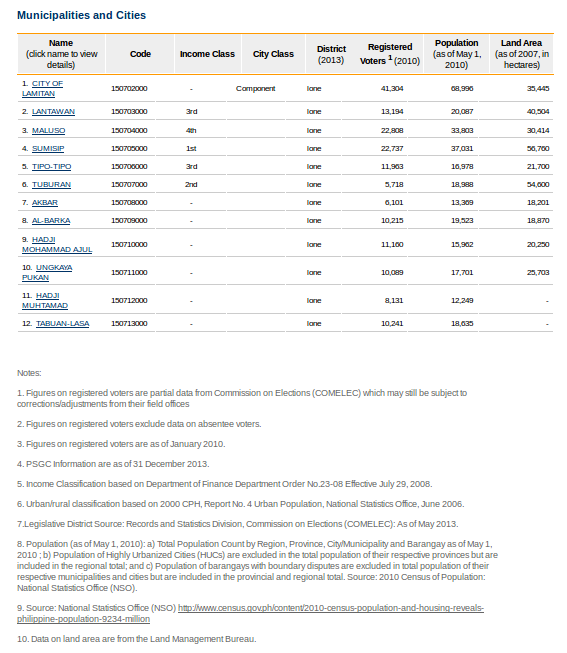 The Basilan School Division has fifteen (15) districts and four (4) districts in Isabela City. 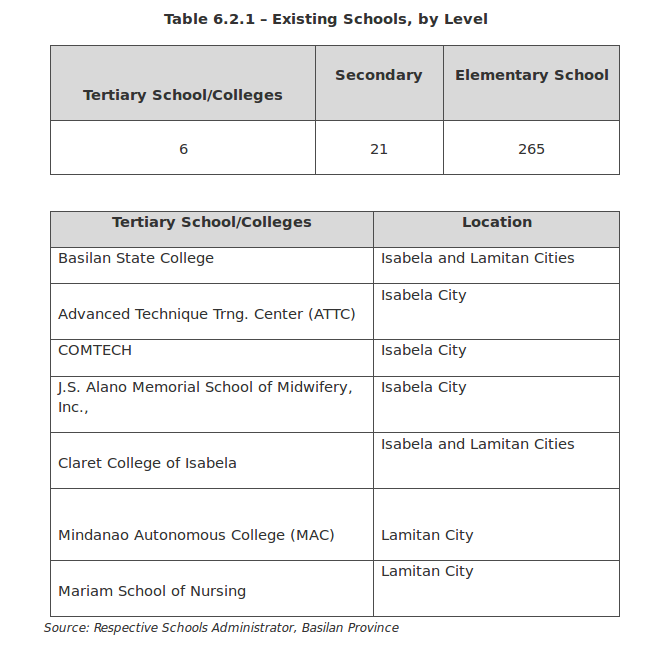 Screenshot of the current number of schools in Basilan. 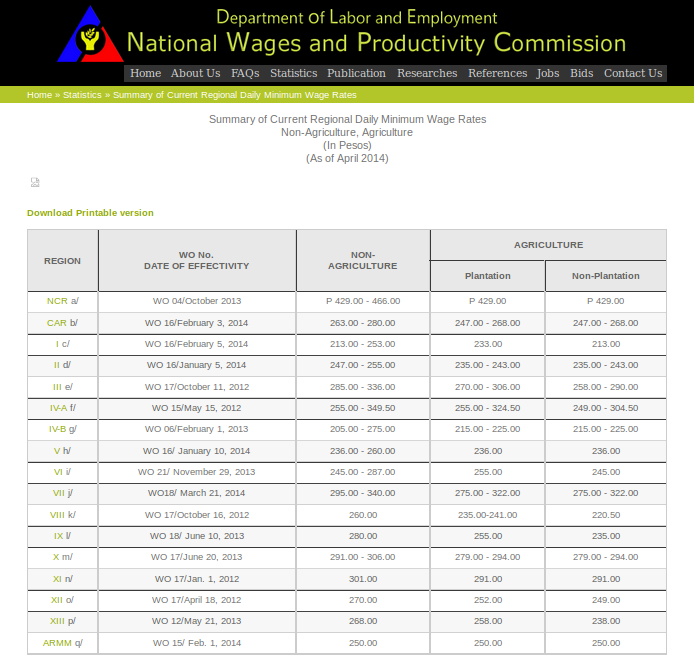 As of April 2014, the minimum wage rate in Basilan is 250 pesos. Screenshot of the minimum wage rate as of April 2014. There are 394 Barangay Health Workers and four private hospitals: the Juan S. Alano Memorial Hospital, Inc. (formerly Basilan Hospital), Infante Hospital, Basilan Community Hospital, all in Isabela City, and the Dr. Jose Ma. Torres Hospital in Lamitan City. There are also four government-run hospitals: Basilan General Hospital and Isabela City Infirmary, both located in Isabela City, the Lamitan District Hospital in Lamitan City, and the Sumisip District Hospital in Luuk-Bait, Sumisip Municipality. As of 08 August 2011, Zamboanga City is the main gateway to Basilan Island which lies 17 nautical miles (narrowest point of the Basilan Strait) due north. If you’re from Manila or Cebu, take a flight to Zamboanga City then take a jeepney bound for Canelar and walk towards the port. From there, a boat ride of 1 hour and 45 mins (for conventional passenger ferries), or 1 hour (for a fast craft), will take you to Isabela and Lamitan. The fare ranges from Php20 (student and senior citizen's discounted fare on some conventional ferries) to P70 (first-class w/ aircon). Fast craft usually charge P140 for ordinary and P170 w/ aircon. Terminal fee is 11 pesos in Zamboanga City and 4 pesos in Isabela port. 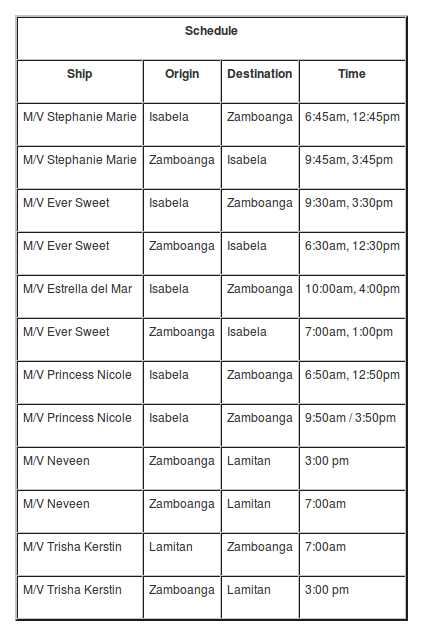 Screenshot of the daily schedule of ferries.